Taking 4 or more classes? take additional 10% off! Have 4 on or more students in your group? Call 713-777-7664 to Schedule & We can hold the class specially for your group. Do you prefer on-site training at your office or home? Call 713-777-7664 to arrange on-site training that can be customized for your specific needs. 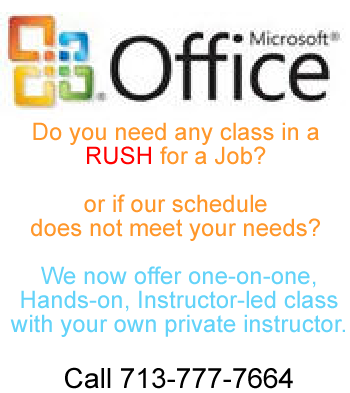 Do you need any class in a RUSH for a job - or if our schedule does not meet your needs? We now offer one-on-one, Hands-on, Instructor-led class with your own private instructor. Call 713-777-7664 to arrange one-on-one Tutorial style training, with your own private instructor. Would you prefer a longer sessions rather than 1 day classes? Now offering 5 sessions Workshop for only $295 each. Diploma of Completion from State Licensed School. Step-by-Step Training Manual with Exercise CD.